Despite their charms, land routes in Myanmar can often be slow, unreliable, and sometimes uncomfortable. So taking the plane is the best option for many – particularly if time is limited. Prices can range from US$40 to $200 for single journeys around the country, depending on the destination and time of year. Core routes such as Yangon to Mandalay and Yangon to Bagan have frequent, direct services; the number of direct flights between Yangon and Nay Pyi Taw is also increasing. However, some internal flights work on a fluid schedule – many operate on circular routes, stopping off at different airports, so you may find you have to go via one place to get to another. The map on this page indicates primary air routes around Myanmar, not all air routes. For more a full list of air routes, get in touch here. To make online flight bookings go here, or go to individual destinations to find more details on airports, timetables and routes. Due to routing and fluctuating demand, planes often do not take off at their designated time (they sometimes take off up to 20 minutes early). With most domestic flights, you should check that your flight is on schedule with your travel agent or airline 24 hours before departure. Luggage allowance on internal flights is 20kg. All transport, including airlines, is heavily booked in advance before and during the Thingyan water festival in April. For information on public holidays, go here. Although domestic flights are technically supposed to demand immigration and customs checks, security at regional airports in Myanmar is often not what it is should be; some smaller local airport terminal buildings are in fact just huts. Some domestic Myanmar airlines have had safety issues in the past, but incidents are few and far between and there is little to choose between the different operators in terms of standards. Furthermore, the current nature of scheduling and ticket booking processes means that you are rarely in a position to pick and choose between domestic airlines. 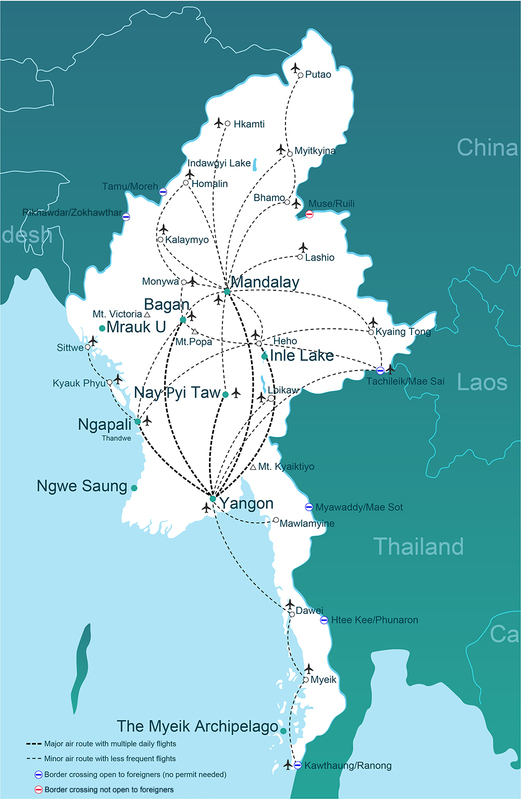 Most domestic airlines serve Yangon, Mandalay, Bagan (Nyaung U), Dawei and Heho (for Inle Lake, Kalaw, Pindaya and Taunggyi). You can check the 'getting there' pages of individual destinations on this website to find timetables and airline information, or you can enquire on our booking form about the latest scheduling, ticket availability and making a purchase.